The recipe for research ideas includes asking good questions, taking advantage of scientific opportunity, and identifying clinical application. Many of the best scientists are not driven only by application – maybe the best are driven by answering questions based on curiosity. Watson and Crick did not work out the structure of DNA in order to improve paternity testing and Jim Allison, a likely Nobel laureate of the next few years, emphasizes the importance of research in test-tubes and mice to his discoveries that have revolutionized cancer treatment. But researchers are also driven by the prospect their discoveries will be used – many of you will know the story of Graeme Clark’s father’s deafness. The key ingredients at SVI are excellence, deep foundations, no cutting corners and a long-term, high-quality perspective – the ethos of science. The challenge for our institution and our sector, is to make a bridge between science and clinical application. We need to celebrate our precious expertise in scientific enquiry directed at common diseases, but also recognise that funding policy has shifted to more applied research driven by clinical need. I’m confident that we can find the balance between these two drivers of our activity that will allow us to address short-term needs as well as putting in place the basis for the translational research of the future. In this newsletter you will read about how our Islet Transplant Program transformed the life of Margaret Harrigan and people like her, whose type 1 diabetes cannot be controlled by conventional means. The Islet Program has been a very successful collaboration funded initially by the Commonwealth and more recently by the States at three centres – here on the St Vincent’s campus, Westmead in Sydney and the Royal Adelaide. We have carried out over 80 successful transplants since late 2007, with many of the recipients now off insulin treatment. Not only has this been a success for the recipients, but it has brought together a consortium that has collaborated in a highly cohesive way. This is an example of where fundamental science – our interest in the pancreatic islet and type 1 diabetes – has leap-frogged to a clinical outcome for patients faced by the disease. You will also read about some of our young and promising researchers, who join us with a host of skills that help fuel research at the Institute. These include new recruit, Dr Wayne Crismani and Clinical PhD student, Dr ShuhYing Tan. Wayne has joined us following his PhD and postdoc in plant genetics, followed by a stint working in the agricultural industry, both of which poise him perfectly to make contributions to research into cancer here at SVI. Shuh has clinical skills which she is augmenting by a PhD, working with supervisors Associate Professor Louise Purton here at SVI and Dr Meg Wall at the Hospital. You will also read about how philanthropy is helping us meet our goals. The event we held at Raheen in August, thanks to generous support from Jeanne Pratt AC, raised more than $100,000 for Professor Michael Parker’s research into Alzheimer’s disease. Our research is made possible thanks to your support, both through your taxes and through philanthropy. I hope you continue to see its worth. SVI alumnus Dr Brian Liddicoat was presented with the 2016 TJ Martin Medal during Aikenhead Centre for Medical Discovery Research Week in August. 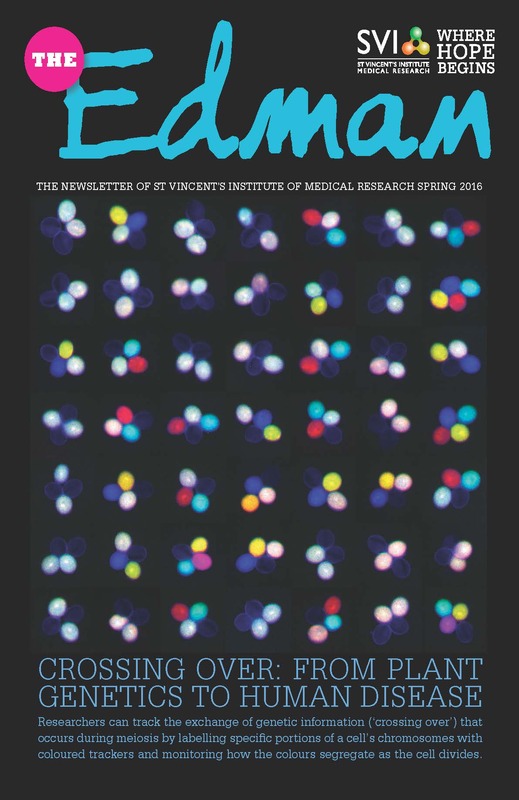 Named in honour of former SVI Director, Professor Jack Martin, the Medal is awarded annually for the best MD or PhD student thesis from the St Vincent’s campus submitted in the preceding year. Brian did his PhD in SVI’s Stem Cell Regulation Unit under the supervision of Associate Professor Carl Walkley. During his PhD, Brian showed that a protein called ADAR1 helps protect the body against viral attack by recognising the difference between ‘self’ and non-self’. Mutations in the ADAR1 gene have been linked to a rare genetic autoimmunity disorder called Aicardi-Goutières Syndrome. The research resulted from collaboration between the group at SVI and researchers in the USA and Germany. The findings were published in October 2015 in the prestigious Journal Science. Brian received the Medal and a cash prize for his work. He is currently doing his postdoctoral studies at the Ebert Laboratory at the Broad Institute in Boston. Prior to his arrival at SVI in April, Wayne Crismani had spent most of his scientific career examining the complex genomes of agricultural crops. While describing his post-doctoral studies, he reveals, almost proudly, that a wheat cell contains more than five times as much DNA as a human cell. Furthermore, wheat cells contain six copies of each of their chromosomes, compared to the paltry two copies present in human cells. This means that when the pairs of chromosomes of a wheat cell divide to allow reproduction, the process is complicated and highly choreographed. If it goes awry, the resulting cells end up with the wrong number of chromosomes. In humans, this type of error during cell division leads to conditions such as Down Syndrome. To add a level of complexity, in addition to divvying up the chromosomes (a process called meiosis), an exchange of genetic information also occurs between maternal and paternal chromosomes. Wayne explains that this is why human siblings are not identical – we don’t get just one set of chromosomes from our father and one from our mother, but instead sets of unique chromosomes derived from maternal and paternal sections of chromosomes that have ‘crossed over’ with each other. After doing his PhD at the University of Adelaide, Wayne moved to Versailles, France, where he identified that a gene, called FANCM, limits the number of ‘crossings’ that chromosomes can make with their partner chromosome. Controlling crossing over – the speed at which genetic diversity is generated – means that new plant varieties can be produced faster. This is important because if a serious new crop pest surfaces, and a new resistant plant variety is needed, it would take 10-15 years to develop the variety. Controlling the rate of crossing over could allow quicker response times. After his postdoc, Wayne himself ‘crossed over’ to industry, when he was recruited to work for the agricultural biotechnology giant DuPont Pioneer in Iowa, to commercialise his research for the improvement of crop breeding. He enjoyed the time in the USA and gained a lot of experience away from academia, but in 2015 he decided that the time was ripe to return to Australia and turn his attention to human diseases. Strange as it may sound, many human diseases are underpinned by the same biological processes that Wayne was deciphering in plants. During his 3 year Fellowship, Wayne will be working with Dr Andrew Deans in SVI’s Genome Stability Unit. Researchers in the Unit focus on a rare disease called Fanconi Anaemia – a heritable disorder where bone marrow failure occurs on average at 7 years old and is the major cause of death at around age 16. One of the genes responsible for preventing Fanconi Anaemia is FANCM – which was the subject of Wayne’s previous work. SVI researchers, in collaboration with scientists at the Bio21 Institute and the Victorian Life Sciences Computation Initiative of the University of Melbourne, the New York School of Medicine and the University of Oklahoma in the USA, have shown how the bacteria Gardnerella vaginalis targets cells and causes infection in women. Gardnerella vaginalis is the bacteria primarily responsible for bacterial vaginosis (BV), the most common vaginal infection worldwide. One of the bacteria’s tools for establishing infection is a protein toxin, vaginolysin. “We found that the toxin vaginolysin – which unlike many other common toxins only targets human tissues – is attracted to cells that have the receptor protein CD59 on their surface. The normal role of CD59 is to ‘turn down’ the body’s immune system so that it doesn’t attack cells that don’t pose a threat. Vaginolysin has hijacked this activity, allowing the bacteria to use this protective mechanism to single out human cells,” said co-lead author Dr Craig Morton. The work was published in the journal Structure. Dr ShuhYing Tan is doing her PhD with Associate Professor Louise Purton in the Stem Cell Regulation Unit and is the recipient of a Clinical PhD scholarship from the Leukaemia Foundation. My childhood ambition was to...be a lawyer, a writer, a doctor. I was a fickle-minded and a very impressionable kid. My first job was...private tutoring. My worst job was...waitressing at an Italian cafe on Lygon St. The passive smoking (including cigars) was literally too hard to take in! I only lasted a month there. My happiest moment was...predictably, the birth of my kids. I got into research because...it is pivotal in answering the how, what and why in medicine. In this genomic era in haematology, it is becoming ever so important to be able to apply the science to our daily clinical practice. Personalised and precision medicine - that’s one of the reasons why we need research to improve on the delivery of healthcare. The hardest thing I have ever done was...studying for my specialist exams with a 9 month old at home. If I wasn't doing research, I would...be back practising medicine. If I could live anywhere I would choose...Melbourne! No reason to live anywhere else but the most liveable city in the world. 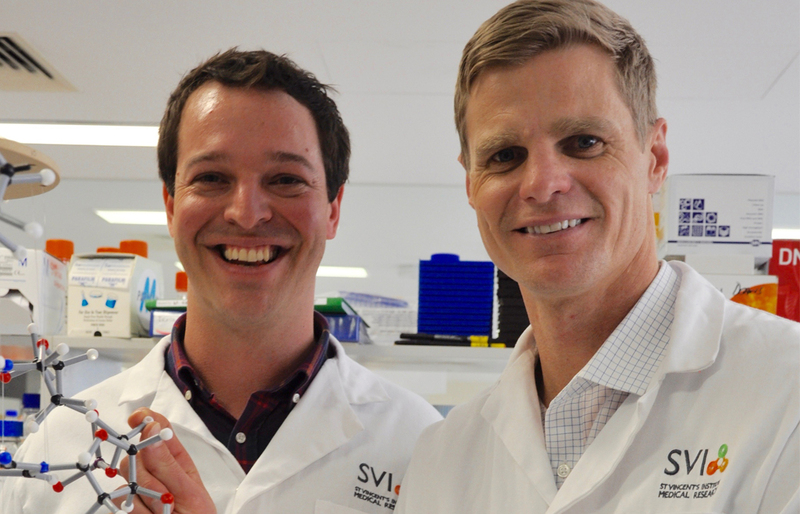 In January 2010, SVI’s Dr Tom Loudovaris gently packaged the precious insulin-producing islets that his team had isolated from the pancreas of an organ donor into a container for transport. When the package arrived at Queen Elizabeth Hospital in Adelaide, the islets were infused into a waiting recipient, Margaret Harrigan. Margaret had been diagnosed with type 1 diabetes in 1976. Before she was selected for the islet transplant procedure, she had been dependent on five insulin injections per day, as well as having to check her blood glucose levels up to 15 times every day. For Margaret, type 1 diabetes meant that she could not travel unaccompanied, work as a teacher or look after her grand-children alone. In short, the threat of losing consciousness due to low blood glucose levels meant that she could not lead an independent life. In June 2010 Margaret received a second islet transplant at the Royal Adelaide Hospital, and shortly after she became insulin independent. August 26th 2016 marked the sixth anniversary of this life-changing event. Margaret’s islet transplants were performed by the Australian Islet Transplantation Program (ITP), which involves SVI, in collaboration with St. Vincent’s Hospital Melbourne and the Royal Adelaide and Westmead Hospitals. In type 1 diabetes, immune-mediated destruction of the cells that produce insulin in the pancreas means that those affected are dependent on insulin injections to stay alive. In some people, this treatment can drop blood glucose to dangerous levels (hypoglycemia) without warning signs, which may lead to a life-threatening loss of consciousness. The islet transplantation procedure is currently aimed at people with severe hypoglycemia, but further research may lead to a more generally available clinical procedure. The ITP is supported through the Nationally Funded Centre Program. Around 140,000 Australians live with type 1 diabetes, with many diagnosed in childhood. People with type 1 diabetes lack insulin, the hormone that regulates the body’s use of glucose. Insulin is normally produced by beta cells in the pancreas, which are contained within small clumps of cells called islets. In type 1 diabetes, the beta cells are mistakenly attacked and destroyed by the body’s own immune system. Without the ability to produce insulin, people with type 1 diabetes are dependent on insulin injections to regulate their blood glucose levels. The condition is difficult to control and, as a result, patients may suffer devastating consequences, including accelerated cardiovascular disease, kidney and eye disease, and even premature death. Islet transplantation is a therapy for type 1 diabetes that is used in people for whom insulin treatment has failed. The patients treated have life-threatening hypoglycemia (very low blood glucose). In islet transplantation, islets are extracted from the pancreas of a deceased organ donor and infused into the liver of the recipient. Once transplanted, the islets begin to produce insulin, and can regulate the level of glucose in the blood. The recipient has to take immunosuppressant drugs so that the islets are not rejected. Islet transplantation is an extremely specialised and complex procedure and only a few hospitals world-wide provide the treatment. The Australian Islet Transplantation Consortium includes researchers and clinicians in Victoria from SVI, St. Vincent’s Hospital Melbourne; in NSW at Westmead Hospital in Sydney; and in South Australia at the Royal Adelaide Hospital. The Consortium uses a ‘spoke and wheel’ model of islet transplant delivery, where islet isolation is carried out in specialised centres (including at SVI) and shipped to point of care centres for transplantation. The Consortium has carried out a total of 89 transplants into 44 patients. Nineteen of these people have subsequently become insulin independent, although most needed more than one transplant. Even in the people who have not become fully insulin independent after the transplant, the great majority no longer experience the life-threatening hypoglycaemia that they suffered prior to transplantation. As well as performing successful islet cell transplants, ITP clinicians and scientists are working on ways to make the procedure safer and more effective. The ITP also provides a valuable opportunity for clinical research on human islets that are not suitable for transplant. Please get in contact with the Clinical Nurse Coordinator, Ms Kathy Howe (ph (03) 9231 3678, email [email protected]) if you would like further information. We have recently hosted a number of groups who were keen to learn about the breakthroughs in the making at the Institute. In August, some of the ladies from the SVI Support Group visited to hear from the students that they have supported through SVI Foundation Top-up Scholarships. Recipients of the 2016 Scholarships, Toby Dite, Niloufar Ansari, Jasmina Markulic, Kiryu Yap and Fei Fei Gong presented a layman-friendly version of their projects to the ladies and were peppered with many pertinent questions. The students are looking forward to attending the SVI Support Group Dinner in October. Our researchers have also pulled back the curtain on medical research for students who recently visited from Genazzano College and FCJ College Benalla. Former SVI Director Professor Jack Martin, whose sister attended FCJ College Benalla, introduced their students to SVI’s research. They then visited Dr Andrew Deans in the Genome Stability Unit, Dr Craig Morton from Structural Biology and heard from Bone Cell Biology and Disease PhD student Christina Vrahnas. The Genazzano students had the chance to hear from Professor Tom Kay, Associate Professor Helen Thomas, Head of the Immunology and Diabetes Unit and Drs Belinda Michell and Tracy Nero from the Structural Biology Unit. PhD students Claudia Selck (Islet Biology) and Jasmina Markulic (Structural Biology) shared stories of their personal journey to science and medical research with the students. Jeanne Pratt AC hosted a dinner for 96 guests at her historic mansion Raheen on August the 4th. More than $100,000 was raised on the night to support Professor Michael Parker’s Alzheimer’s research at SVI. Below is an excerpt from Michael’s speech. “In 1906, Dr Alois Alzheimer gave a lecture in which he described for the first time a form of dementia that subsequently became known as Alzheimer’s disease. In the 110 years that have passed since that lecture, medicine has advanced in great strides, but there is still no effective treatment for Alzheimer’s. One in ten Australians over 65 live with dementia, of which Alzheimer’s is the most common form. The World Health Organization predicts that the number of people with Alzheimer’s will almost double over the next 20 years. If you’re hoping to live to 85 or older, your chance of getting Alzheimer’s will be almost one in two. In my lab, we use the knowledge of a protein’s 3D shape to help us to design drugs. We determine the 3D shapes of proteins using a method called X-ray crystallography. We then use sophisticated computer algorithms to design drugs to fit to the shape of the protein and change its action. My team has been working for over 15 years to find new treatments for Alzheimer’s. There have been many recent advances in understanding the disease. We know that it is linked to accumulation of toxic plaques and tangles in the brain, which are made up of proteins called amyloid-beta and tau. These protein clusters are believed to cause the loss of brain cells that results in cognitive decline. One of the most exciting projects in our lab at SVI focuses on finding a way to clear these protein clusters. We know that the brain has natural ways of removing them, and there is a protein in the brain, called CD33, a known risk factor for Alzheimer’s disease, which impedes this process. Imagine the brain is a city, and like any city, it needs garbage collectors to keep the streets free of garbage. Similarly, the brain has cells that are charged with removing proteins clusters that would otherwise build up. If we could enhance this process in the brain of people with Alzheimer’s, we may be able to help prevent the disease from occurring. However, there is some evidence that the protein CD33 acts like a handbrake and stops the garbage – the toxic protein clusters – from being cleared. My team has visualised the 3D structure of CD33 at its atomic level, and we are designing drugs to fit into its nooks and crannies in order to stop it from working. This will essentially improve the efficiency of garbage disposal in the brain, and hopefully impact on the outcome of the disease. However, despite the huge burden of dementia, throughout the developed world far less money is spent on researching a cure for Alzheimer’s than researching cancer treatment – in Australia, even with a recent injection of funds, about 5 times more is spent on cancer research. Without a medical breakthrough, the cost of dementia is set to outstrip that of any other health condition. And this is why philanthropy is so important. It helps us to respond nimbly to new knowledge, keeping us at the cutting edge of research; it helps fund equipment that is necessary for us to do our experiments; and it helps us to recruit the most talented researchers. Our thanks to Jeanne Pratt AC for her generosity and to Susan Alberti AC for facilitating the evening. In his mid-thirties, unmarried and with no kids, David Tarascio doesn’t fit the typical profile of an SVI bequestor. However, unlike many other ‘30-somethings’, David has taken the time to prepare a Will and bequest a portion of his estate to SVI. A successful businessman in his own right, David is CEO of Salta Capital, a private investment company his family set up to invest in ventures external to the family’s core property development business, Salta Properties. Knowing that at least 45% of Australians do not have a valid Will because they think they are ‘too young’, we wondered what prompted David to prepare one. “Well, a couple of things. My good friend Mark Sullivan, who is a member of SVI’s Breakthrough Support Group, and a financial planner has suggested it a few times. “In terms of good causes, SVI is the one I’ve been involved with the most and it stands out to me; I have the most interest in it. I first got involved with SVI by helping to establish the Breakthrough Group, a fundraising support group that raises funds for SVI through special events. “I’m quite a skeptical person when it comes to charities, but I find SVI to be well run, obviously established and with a lot of room to grow in a very competitive area (medical research). I would like to see it grow and get bigger and better. How did you find the process of creating a Will? Did the SVI brochure help? How did your friends/peers respond to your decision to leave a Bequest? Many of them were quite surprised at first, however I think it has spurred some of them on into thinking about it themselves. What do you think are the biggest challenges or opportunities facing medical researchers in the future that you hope your bequest might help?